Photo: USS Carney returns to its homeport of Mayport, Florida flying the 280-foot-long Homeward Bound pennant made by C. Anderson & Company. The boats at Shilshole Bay Marina provide a clear view of the water through their unadorned masts. So clear in fact, that a passerby can't tell anything about the travels those boats make. In ports in other areas of the country, a marina like that would be an explosion of colorful flags, documenting the journeys of the vessels. Carol Anderson had a bustling flag making business for boaters back in Newport, Rhode Island. But, since starting Seattle Flag Makers last year, most of Carol's business has come from out of state including one very tall order from the US military. Carol tells Megan Sukys what she loves about the art of flags. Tradition can be stodgy, written off. But the sight of colors flying from boats does my heart good. The history of vessels flying flags is enormous and so fascinating. We first met our flagmaker friend when looking online for a private signal or burgee for PEREGRINA. There are other possibilities out there, but when communicating with Carol Anderson of C. Anderson & Company, it became clear this was more than a business transaction for her. There is the passion of an artist in her work. Flags connect us with history - they are also art. CaroI had a flag shop called Flying Colors Ltd, on Thames Street in Newport, Rhode Island for nearly fourteen years. After relocation to Seattle she reinvented her passion for flags through the internet. Here I am a transplanted Nor'westerner in New England, wanting a flag. So who do I find but a transplanted New Englander in Seattle who has been a professional custom flag and banner maker since 1983. She can make flags, and every boat should have one. After moving to Seattle from the east coast a decade ago, Carol Anderson would go for walks along Shilshole Bay Marina and be struck by how bare the boats looked. Where others saw rigging and masts, Anderson saw places where flags could — should — be. A custom flagmaker, Anderson had run her own flag shop in Newport, Rhode Island for 14 years and did a brisk business. Looking at the unadorned boats at Shilshole, Anderson saw a market waiting to be filled. She opened her own business in 2007, operating under the name C. Anderson & Co. Custom Flagmakers and working from a studio in Seattle’s Fremont neighborhood. Anderson's most popular designs include a whale, a crab and a cocktail glass. But the boating business didn’t quite come pouring in as Anderson had hoped. She discovered a fundamental cultural difference — east coasters flew flags but on the west coast, not so much. For Anderson, who grew up in Taunton, Mass., south of Boston, flags were a part of daily life. Her father was in the Army and the U.S. flag was raised at her childhood home every day. When she moved to Newport there were flags everywhere, so Anderson decided to put her sewing skills to use and open shop. She made flags for U.S. Navy ships, America’s Cup teams, hundreds of recreational boats. She made custom flags for homeowners and companies. She made flags depicting “anything anybody ever collected,” from frog motifs to martini glasses. She made flags for Walter Cronkite’s boat. For Ted Kennedy’s 60th birthday, a friend commissioned Anderson to make him a coat of arms flag. There was no shortage of business. A space under Anderson's work table holds colorful bolts of fabric. 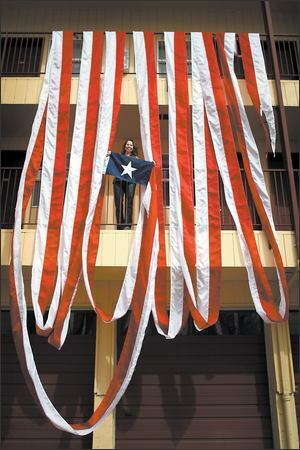 In 2008 she was hired to make her biggest flag yet, a 208-foot-long, 17-inch wide homeward bound pennant for the USS Carney, a 505-foot guided missile destroyer. Under naval tradition, homeward bound pennants can be flown by ships that have been outside of the U.S. for at least nine months. Anderson’s flag was made to mark the USS Carney’s trip home from the Middle East to its homeport of Mayport, Fla.
Making the flag was a challenge in Anderon’s 20-foot-long shop. 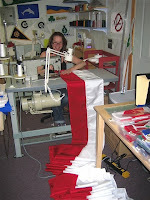 Working on a 12-foot table, she cut and folded lengths of the red and white fabric, over and over again. The work took several days, but Anderson was pleased with the end product. Since then, Anderson has made custom flags for weddings, trade shows, corporations. One woman commissioned personalized flags for her grandson and granddaughter. A fishing guide in Canada, annoyed by other boaters following him around to his favorite fishing spots, had Anderson make a flag with a sheep crossed out by a circle and line. Pirate flags are among Anderson's favorite to make. Fisheries Supply in Seattle has carried some of Anderson’s most popular flag designs, which include a witch, a cocktail glass, a whale and her number one seller, a shamrock. Despite the exposure, boating-related business has been ticking along slowly. Anderson suspects that not having her own retail shop and the economic downturn have been factors. Still, Anderson has no plans to hang up her sewing machine. Her heart, she says, is in flagmaking. She’s drawn by the colorful fabrics, by the sight of a flag waving gracefully in the wind. And she’s touched by the stories shared by her customers, like the woman in Galveston, Texas, whose husband rescued a black lab after Hurricane Ike ripped through the coastal city in 2008. The woman ordered a flag with a black lab on a blue background to give to her husband for their wedding anniversary. “We are still recovering from the devastation of Hurricane Ike and you will be a real ‘happy’ for us and our neighborhood,” she told Anderson in an email. It’s the sort of thing, Anderson says, that keeps her going.